Three curved grass windscreens with ash floors where people sleep next to the fire in the dry season cattle camp. Beyond is the Sobat River, a main source of water during the drought. 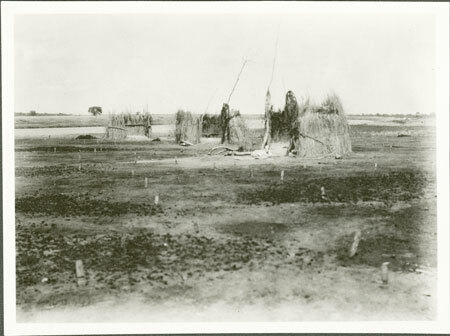 This image may well be of Yakwach camp where Evans-Pritchard spent 3 months in 1931 or close by at Kurmayom (just downstream on the Sobat) where he spent about 3 weeks in the same year. Note on print reverse ms pencil - "09 17 "
Morton, Chris. "Nuer cattle camp windscreens" Southern Sudan Project (in development). 03 Jan. 2006. Pitt Rivers Museum. <http://southernsudan.prm.ox.ac.uk/details/1998.346.17.2/>.